Position racks in the upper and lower thirds of your oven and preheat the oven to 400 degrees F. Generously coat two baking sheets with nonstick spray. 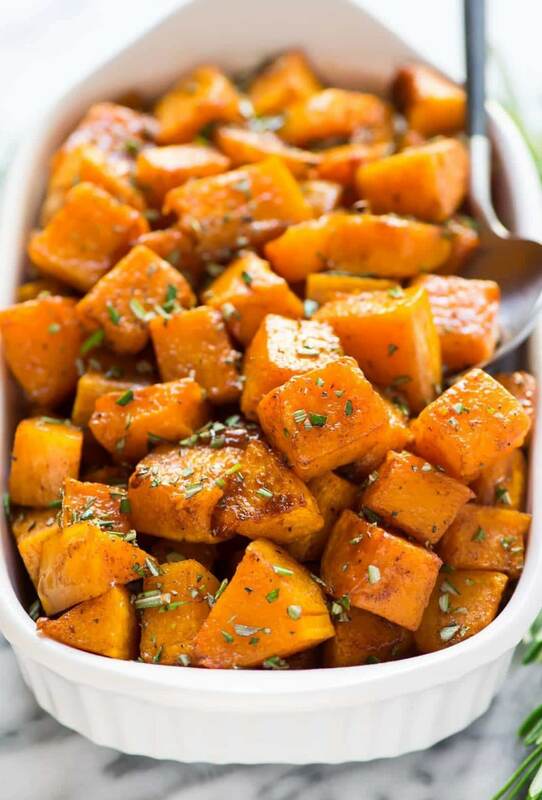 Place the squash cubes in a large bowl. Drizzle with the olive oil and maple syrup, then sprinkle the salt, cinnamon, and pepper over the top. Toss to coat, then divide between the two baking sheets, discarding any excess liquid with that collects at the bottom of the bowl. Spread the cubes in a single layer on the prepared baking sheets, taking care that they do not overlap. Place the pans in the upper and lower thirds of your oven and bake for 15 minutes. Remove the pans from the oven, turn the cubes with a spatula, then return to the oven, switching the pans’ positions on the upper and lower racks. Continue baking until the squash is tender, about 10 to 15 additional minutes. Remove from the oven and sprinkle the rosemary over the top. Serve warm. © Copyright Harvest Sensations 2018. Sensationally Fresh is a registered trademark of Harvest Sensations.